One of the most photographed vantage points of Hong Kong comes from the top of Victoria Peak. As the highest point on Hong Kong Island, the panoramic views of the seemingly endless slew of high-rises jetting out from the green hills below and across Victoria Harbour is a must-see for many visitors. The scene feels a world apart from the serene lookout atop the nearby hills of Ngong Ping, where 38 wooden pillars displaying verses of the centuries-old Heart Sutra prayer are arranged in an infinity pattern, surrounded by nothing but foliage and the occasional glimpse of the South China Sea. Perhaps surprising, Michael Lim, the director for Canada, Central & South America for the Hong Kong Tourism Board, points out that 70% of Hong Kong is actually rural and natural land, and there’s plenty to do for travellers who are interested in active experiences like hiking and biking. 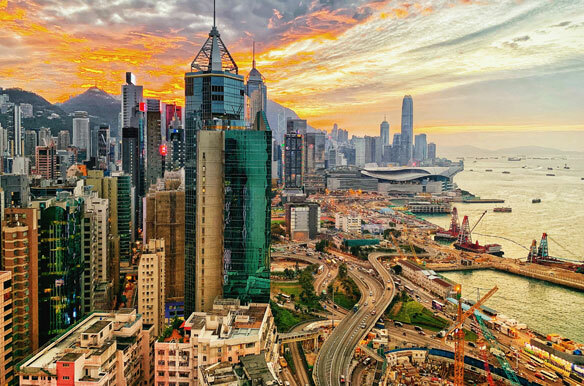 Described as Asia’s world city, Hong Kong is in itself full of contrasts. Here, old meets new, East meets West, and 7.3 million locals meet 60 million annual visitors. A key campaign for the destination revolves around encouraging travellers to discover Hong Kong like a local, through initiatives like neighbourhood walks and tips from those who live there. Along with the Wisdom Path, there is a lot to explore on Lantau Island. 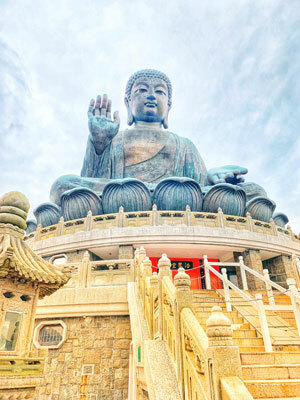 A popular draw is The Tian Tan Buddha, also known as the Big Buddha located on the peak of Mount Muk Yue, which took 12 years to plan and build. The adjacent Po Lin Monastery is home to devout monks and features multiple temples, including one that boasts 10,000 Buddhas. Grab a bite to eat at the on-site vegetarian kitchen or sample desserts like warm soy bean pudding and black sesame roll. The ride up to Lantau Island is just as scenic on the Ngong Ping 360 Cable Car, which is also a great way for travellers to get a view of the newly opened Hong Kong-Zhuhai-Macao Bridge. Beyond Victoria Peak, there are no shortage of options for visitors to admire the skyline, ranging from swanky rooftop bars to a cheap ride on the StarFerry across Victoria Harbour, which costs less than 50 cents. To get a feel for the views from a local commute, ride the tram, one of the oldest forms of transportation in Hong Kong. There are also TramOramic Tour options on a 1920s-style tram, which engages travellers with a history lesson offered in eight different languages through personal headsets. Another option is the Sky100 Observation Deck, on the 100th floor of the International Commerce Centre in Hong Kong, the 10th tallest commercial building in the world and the tallest building in Hong Kong at 393 metres above sea level. Embark on a guided or self-guided walking tour through neighbourhoods like Old Town Central and Sham Shui Po. 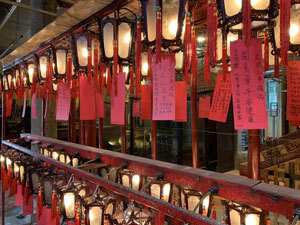 Old Town Central features a multitude of cafés and restaurants, along with the picturesque Man Mo Temple and the vibrant murals of Hollywood Road. “You’ll see how each neighbourhood has its own story to tell,” says Lim. Stopping along the way for culinary delights like dim sum and bowl pudding or registering for the Sham Shui Po Foodie Tour to try a variety of local flavours, including shark soup, is also recommended. Meanwhile, a visit to Mei Ho House Museum provides insight into how vastly public housing in Hong Kong has changed over the decades. Today, the site of a youth hostel, the property was originally part of Hong Kong’s oldest public housing complex, Shek Kip Mei Housing Estate, which was built after a fire left nearly 58,000 homeless in 1953. 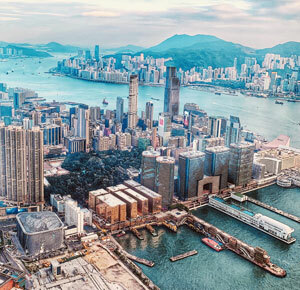 Finally, an area that’s up and coming is the development of West Kowloon Cultural District, a large cultural project geared at blending art, education and open space, with a harbourfront promenade and the M+ Pavilion, an exhibition event space. While posing in front of the Yik Cheong Building is a popular spot for an Instagram selfie, the tenants have complained about how the area gets overcrowded and disrupted with tourists. Since English is widespread, Lim says Hong Kong is a great option for travellers seeking an introduction into Asia, or can be packaged with Mainland China, Thailand, Vietnam, or Taiwan to appeal to multi-destination travellers.